Thanks to the less than desirable battery life of my iPhone 4 I am forced to hide its true beauty with a Lenmar external battery case. Which makes it difficult to find a stand that fits this non-standard size. But then why go buy something when you can make it yourself. And personalize it while you are at it. After all I do have a Cube 3D printer, right? So I measured my iPhone’s battery case, fired up Alibre Design and designed my very own personalized iPhone stand. Nothing fancy. Just something that gets the job done. 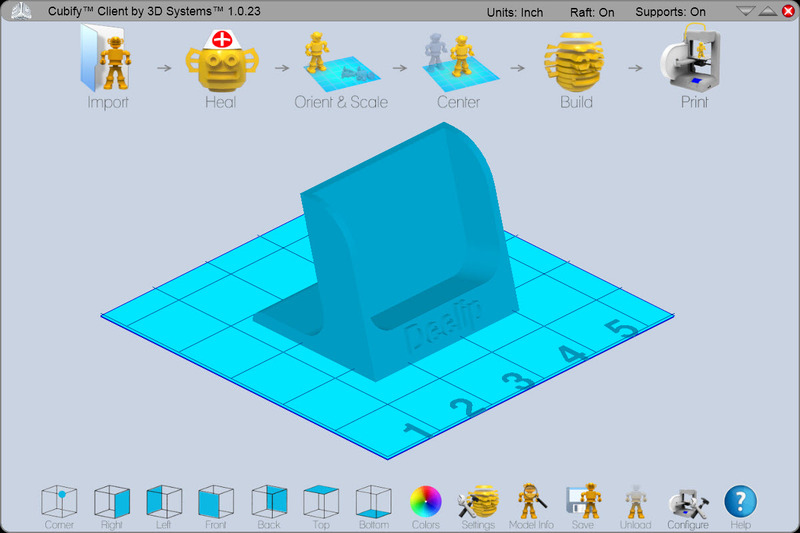 I exported to STL and loaded the file into the Cubify Client software. I hit “Print” and took my family to watch “The Amazing Spider-Man“. When I returned back home the Cube had cooked up my iPhone stand. My boys hadn’t seen my design on the computer. So I was curious to see their reaction when they saw my name on 3D printed iPhone stand. Jaws dropped as they stared at the print still stuck to the Cube’s print pad. Finally four year old Russell turned to me and declared, “Dada, the Cube knows your name“.